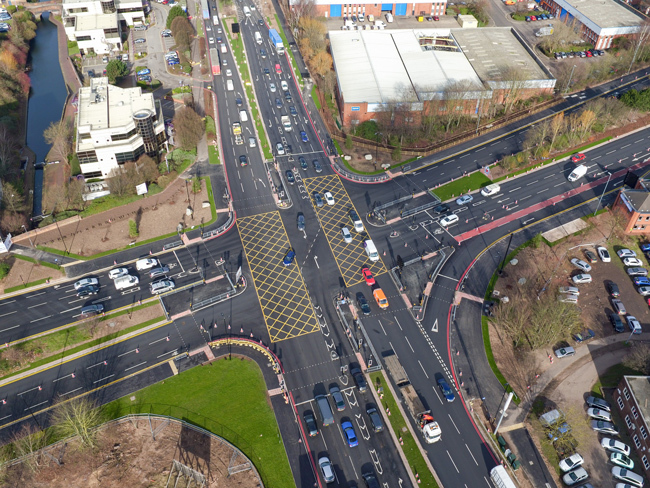 McPhillips undertook the design and construction of the Ashted Circus Ring Road Pinch Point Scheme on the north east section of the Birmingham ring road in order to reduce congestion and improve access to Aston University and Birmingham City University, Eastside, and the planned Curzon Street High Speed 2 station. The project was carried out on an NEC Option C contract. 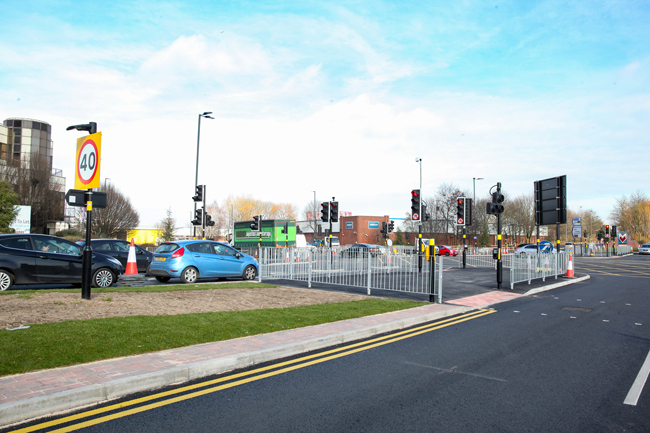 We managed the design process using our highway designer to produce a scheme that converted the existing 4-leg roundabout and pedestrian underpasses on the A4540 Lawley Middleway to a signalised cross road junction with new footways at road level and signal controlled toucan crossings. On-site activities included significant utilities work in the junction quadrants for which McPhillips underook the civils activities including diversion of a 36” gas main, water, low voltage electric and multiple telecoms provider’s equipment. The existing underpass access ramp parapet walls were demolished below finished road level and pedestrian subways were infilled with mass-fill concrete. Following this 10,000m3 of material was required to infill the roundabout of which 4500m3 was as-dug and recycled material generated on-site. 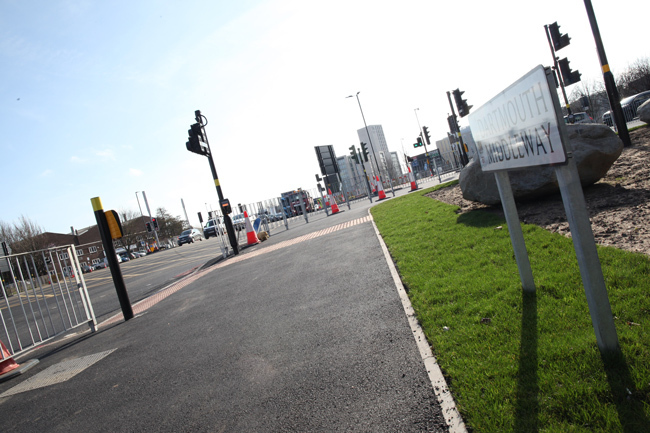 Existing highway kerb-lines were adjusted to realign the A4540 Lawley Middleway, B4114 Jennens Road and A47 Nechells Parkway to suit the new junction layout. 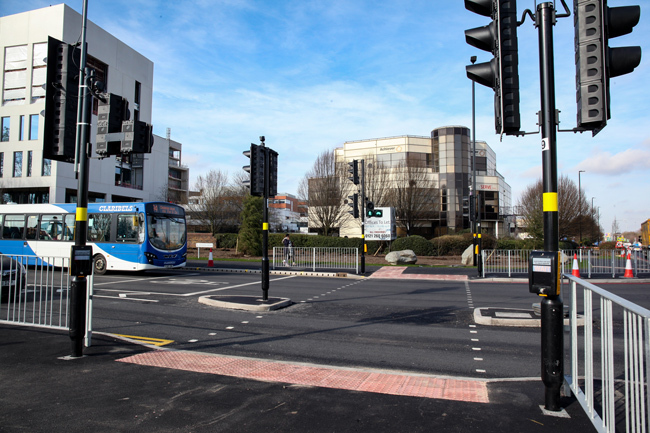 250m of unsegregated shared use footway/cycleway was provided to connect to existing advisory cycle routes and an additional 600m of new footway was constructed alongside the main carriageways. New LED street lighting was provided with 26nr columns and new magnetometer controlled traffic signals were installed. Signage, pedestrian guard rail and timber fencing were provided. Soft landscaping work involved planting trees and shrubs in the new verges. Completion of the scheme included final surfacing during which 13,280m2 of existing binder and surface courses were planed out and replaced with 60mm heavy binder and 45mm surface courses. 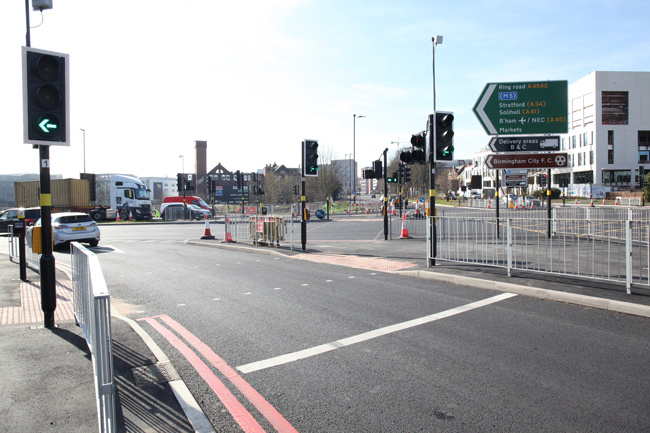 We carried out many activities overnight to reduce congestion on the busy route and the majority of the work was carried out using single lane closures to maintain traffic flows. We set ambitious social value targets on the project and delivered over 600 person weeks of targeted recruitment and training to residents of Birmingham.